As the largest surviving structure from Ancient Rome, visiting the Colosseum was on our must see list for visiting Rome. Although you can purchase tickets at both the Roman Forum and the Colosseum, we chose to go with an independent tour company. If you choose this route, there are a multitude of tour companies to choose from. 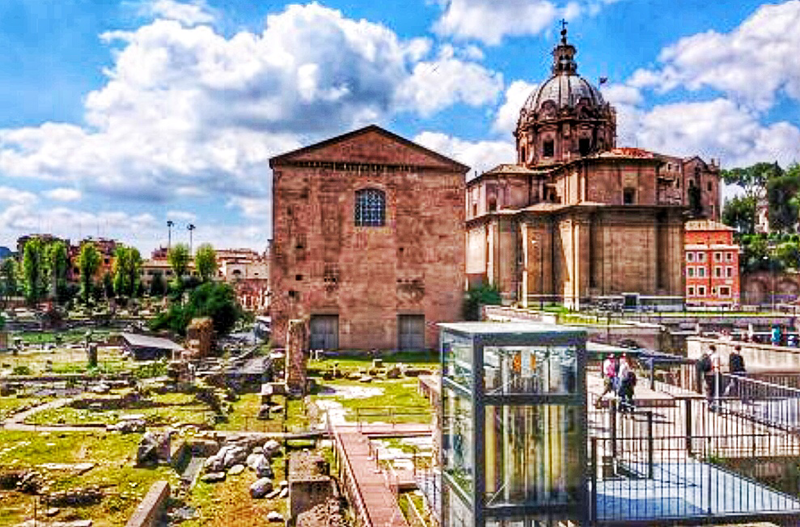 We chose Dark Rome and a tour titled “Underground Tour with Arena, Floor, Third Tier & Roman Forum”. The ticket also allowed us to skip the long lines that usually go hand in hand with entrance to the Colosseum. ProTip– If you plan far enough ahead, you can purchase the same tour directly from the Colosseum at CoopCulture. After registering, we were e-mailed detailed instructions of the meeting point. We found the meeting point easily, just outside the Colosseum metro station. We arrived about 15 minutes before the tour start time, per the instructions, and found it to be more than enough time to meet the guide. ProTip-Most group tours meet in the same location, so street vendors gather there to try their best at selling their trinkets. This can be perfect for you-say if you forgot your sunglasses or selfie stick, they will have you covered. For most though, they will be on the unwelcome side. For those that have no need for their items, we found telling them “Grazie” a few times usually gave them the hint to move on. Once our group was checked in, our guide greeted everyone and handed us a microphone pack with earbuds to begin sound check. It was then that we found out the guide would walk us to the Colosseum and hand us off to another guide for the Colosseum tour before meeting us again for the Forum part of the tour. ProTip-bring your own earphones for tours. The ones provided are not comfortable for everyone’s ears. I snapped a few pictures before we walked over to the entrance area. Once the group was ready, our guide walked us across the street over to the Colosseum. His job at this point was to lead us to the security line and ensure we got through security. Well…let’s just say things didn’t quite go so smoothly. The area leading to the entrance was extremely crowded and it felt like everyone was pushing their way to the security entrance. We, along with many others, could not keep up with our guide. When we made it to the correct security line, we could no longer see our guide. However, after running through the line past other groups, we could finally hear him yelling at everyone to throw away all liquids. We all looked at each other, thinking it was odd, but complied. When we actually got to the security gate, we were told by the security officers that only glass bottles should have been thrown away. Needless to say, there were quite a few unhappy people. ProTip-Prepare for crowds, be ready to power walk/run and be familiar with security rules before you arrive. Once we made it through security, we were met by the Colosseum guide, who would lead us through the Colosseum. While we started toward our first stop, the arena floor, I snapped a few pics of the outer ring. Our guide pointed out to us the holes in the walls and informed us that they are made with travertine stone and set without mortar. The builders used the holes to attach their iron clamp scaffolding in order to keep building higher up. Most of the exterior walls have been destroyed by earthquakes and pillaging over the last centuries. In fact, much of the remaining walls are actually the original interior walls. We learned that without two Roman inventions, concrete and vaulted arches, the Colosseum probably would not have been possible. The vaulted arches, made of concrete and stone, made the ceiling much stronger than it otherwise would have been. The support beams for the arches were made of Travertine which was quarried from Tivoli, 20 miles from Rome. We were taken by surprise to see a cross as we entered. It is there to commemorate Christian martyrs who some believed died at the hands of various Roman Emperors. The cross now stands in the area where those Emperors once sat. When entering the Colosseum, it felt similar to entering a medium size outdoor sports arena. Although it once held around 50,000 spectators that were entertained with gladiator fights, animal fights and even naval battles, it was easy to picture these things possibly still taking place in a setting such as this. It was overwhelming to be standing at the exact same level that gladiators would have entered from back in the day. The fact that this area is tightly controlled to allow only a certain number of visitors at one time, makes for a pleasant viewing experience. It made it easy to concentrate on the guide and roam around and take pictures without much distraction. With most of the arena level platform missing, your view is directly into the series of underground tunnels where prisoners and animals were kept. View into the underground. Notice the scaffolding. After a few minutes, the discussion turned to the scaffolding and ongoing restoration project. With the outside part now complete, they are currently focusing on restoring the interior. They are restoring passageways, underground vaults, the arena floor and building a visitor’s center. Side note: On another tour, the guide told us there are discussions to extend the metro under the Colosseum and build an underground shopping mall. The Colosseum once had 80 entrances that also doubled as exits. The design met safety standards to allow people to leave and enter as quickly and efficiently as possible. It is a similar method that many architects use today in many modern day arenas and stadiums. We were surprised to learn that in cases of emergency, the entire Colosseum could be vacated in 3 1/2 minutes. We highly doubt, once panic sets in, we would be able to clear even one set of stairs in the same time frame at a modern day arena. A person’s status in society dictated where people entered, sat and exited the arena. The higher your status in society, the closer your seat was to the action. All male visitors had seats, but females had to stand and watch from the balconies at the top. Special boxes were provided at the north and south ends for the Emperor and Vestal Virgins, giving them the best views. Senators were seated at the same level, giving them the option to either bring their own chairs or etch their name in the one they occupied in the arena. Some names are still visible today. Below (first row, left side) are marble seats that have been restored or replaced, where the Senators seats were located. You can see how close they were to the action. After taking a few minutes for pictures, our guide led us to the gate where we entered the underground. The gate is closely guarded- an official opened the gate for our group and closed it immediately behind us. We walked down a staircase to enter the hypogeum, or underground. Upon entering the underground area, you notice a definite drop in temperature. The chill in the air made for a great break from the heat, but felt a bit spooky. This area was at one time two levels and was added by Emperor Domitian some years after initial construction of the Colosseum. We listened as our guide told stories of the inter-working’s of the area. The area is comprised an intricate network of tunnels, passageways, rooms and storage spaces primarily used to hold slaves and animals used in the games. It was the area where slaves and animal keepers would have performed their duties of operating elaborate mechanical devices to lift up animal pens and gladiators to the arena floor. Stage props were stored here. There were thirty-six hidden trap doors which allowed for seamless transitions between different battle scenarios and allowed each master of ceremonies to customize battle scenes to their liking. The area was updated a few times to increase the variety of entertainment options. The updates allowed for bigger and more spectacular entertainment to keep surprising the crowd. The picture above is a replica of the lift that took the animals to the arena floor. We also viewed the aquaduct where water and sewage was moved in the underground. After nearly a half hour, we started the ascent back up to the upper levels. We began the walk to the Third Tier. This is when not having water became an issue. Erica had to opt out of the final climb to the Third Tier due to the steepness and large size of the steps as she became dehydrated making the climb from the lower levels. She was happy that our original guide met back up with the group at the entry point for the third level as he had water with him that he willingly gave to her. The views were spectacular and the climb was definitely worth doing for those that could do it. Everyone except Erica in our group made the climb. Although there are elevators in other areas of the Colosseum, there isn’t one leading to this level. After descending down the stairs of the third tier, our Colosseum guide officially handed us back to our guide from Dark Rome. Erica and my mom left the tour, so Erica could get some rest. 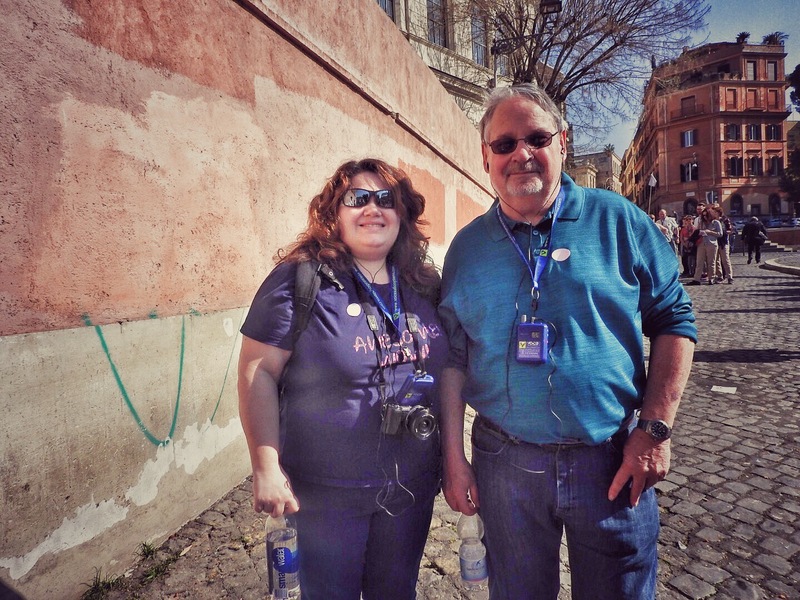 My dad and I continued with the group onto the Forum and Palatine Hill. The entrance was a quick walk across the street, situated between the Colosseum and Piazza Venezia. Once we arrived, we were given a chance to take a short bathroom break before walking to the Forum/Palatine Hill area. We first walked to Palatine Hill. At this point my dad and I were both tired, so we felt every bit of the steep climb. What initially looks like piles of rubble, is actually what remains from the most ancient part of the city and one of the most important archaeological sites in the world. Archaeologists have sited evidence of people living in the Palatine Hill area as early as 10th Century B.C. As Roman citizens attended performances at the Colosseum and went about their daily lives in The Forum area, many probably looked up at Palatine Hill envious of the opulent palaces belonging to the Emperors with their own private stadiums and thermal baths. The Hill towers look over both The Forum and Circus Maximus. After a brief 30 minute visit, we walked down to the Forum. One must use their imagination to picture the masses that would have gathered to hear speakers, attend criminal trials, or just socialize. It was during Caesar’s time, when Rome was the capital of an empire, that the Forum was used for celebrations and became a symbol for Rome. The Senate was one of the most enduring political institutions in Rome, being established right after the city was established. For many years, being in the Senate came with great power. In Imperial Rome, the Emperor had absolute power. Senate seats were still highly sought after for prestige and social standing, but held little power. Many people believe Julius Caesar was assassinated in front of the Senate building, but evidence exists that rules this out. It is believe that he was assassinated closer to where his temple resides. The Roman Senate building along with the other intact structures owe their current good condition because they became christianized. These are the bronze doors (see picture) are from the Temple of Romulus that became the Church Giovanni Battista Falda. Most of the remaining structures are in ruin. The Forum has been impacted by flooding from the Tiber and changes to elevation of the landscape. Final Thoughts: The consensus from the gang was the the tour was helpful to understanding the history of the places we visited, but too long to pay attention the entire time. If we had to do it again, we would have chosen to break up the Colosseum and The Forum tours. There was free time to take pictures at the Forum after the tour, but after not having nearly enough water to last 4 1/2 hours,, our first priority was finding somewhere close by to sit down and eat lunch. -The steps are steep and many, so prepare accordingly. There is an elevator available at for certain levels, but it isn’t well publicized. -Good activity for teenagers and above. -Be familiar with the history of the Colosseum & Forum areas-know what areas you are interested in learning more about. We just booked a trip to Rome and will be going with a total of 6 adults and 3 kids. I can’t wait, but I am a little worried about all of the walking with my father-in-law who doesn’t do well with a ton of steps. Did you see anyone on motorized scooters or wheelchairs,or was it all people walking? Hi Tanya, we didn’t see anyone with motorized scooters or wheelchairs. I’ve read that they’re not as popular as manual wheelchairs and that falls in line with what we saw. We saw quite a few people out in the streets using manual wheelchairs with people pushing them. The Colosseum has ramps and an elevator, so most sections can be accessed that way. The center of the city is mostly cobblestone roads without sidewalks, but most of the main roads have sidewalks so it would be easier to stick to those. If visiting the Vatican without a tour, it tends to be more crowded during the morning. I think it would be easier to visit it on a tour though because guides seemed concerned about their clients getting from place to place. Not all metro stations had elevators, so using buses and taxis would be better. I hope that helps some. Rome is such a great city, it might be challenging, but you’ll all have a great time!